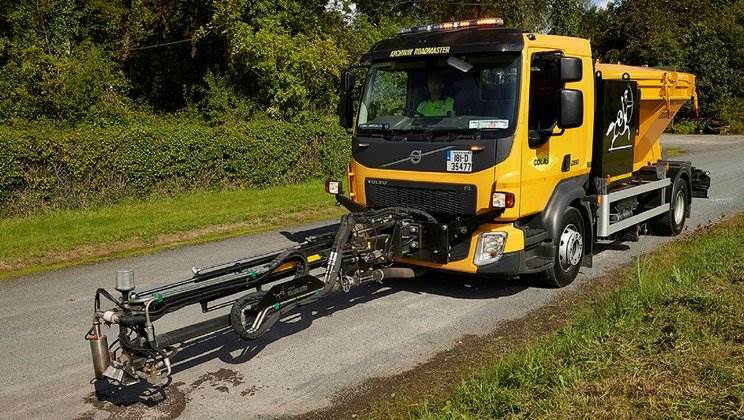 County Leitrim-based, Archway Products has put Volvo Trucks’ technical capabilities to the test by fitting their unique state-of-the-art Roadmaster road repair machinery bodywork on to a new Volvo FL rigid vehicle. County Leitrim-based, Archway Products have fitted their unique state-of-the-art Roadmaster road repair machinery bodywork on to a new Volvo FL rigid vehicle. Archway Products has already built its specialised Roadmaster bodywork on to Volvo’s FM and FE chassis, but the latest FL rigid has the shortest wheelbase - 3,800mm - which the body will allow and is typically specified for rural areas with narrow roads. Powered by Volvo’s D8K Euro-6 engine rated at 280hp, Archway Products’ latest FL 4x2 rigid is also equipped with a fully-automatic Allison gearbox that powers a Power Take Off (PTO). The features front steel, rear air suspension set up will be used as a company demonstration vehicle. The Roadmaster body is fitted with an elongated hopper to store chips and a container to store binder, as well as having a hydraulically-controlled articulated boom fitted which, when not in use, folds across the front of the truck for safer transportation. As the new FL will be used in a ‘semi-parked’ position for most of the time during operation, the company has adopted a number of specific features. A vertical exhaust stack directs fumes away from the roadway and a low ratio rear axle delivers increased torque for use in areas that have steep terrain. The Allison automatic transmission is also a must for the operation because of the stop:start nature of the work. Safety is paramount for Archway when specifying its equipment because the Roadmaster does more reversing than the average truck. The design includes manoeuvring sensors, reversing alarms, rear cameras and a driver-assist function can also be fitted. An LED arrow board can also be mounted on the rear of the Roadmaster enabling the operation to carry out any independent mobile works safely. A recent addition is back bumper sensors which automatically trigger the handbrake should anyone walk behind the reversing vehicle.